Last week was a bit hectic even by my standards. Monday I arrived in London from Kuala Lumpur. 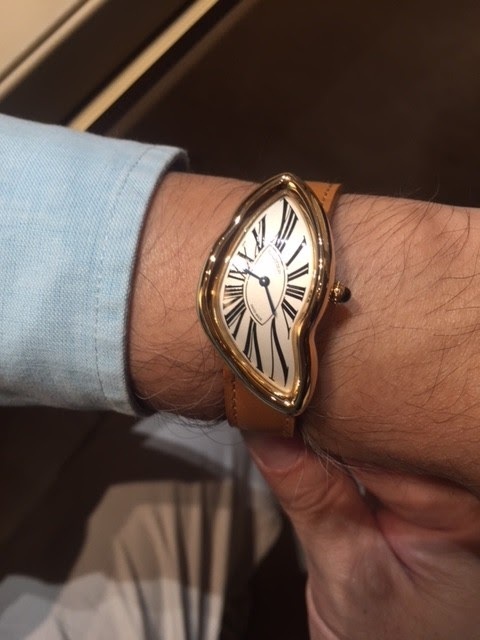 Tuesday I flew off to Geneva for the SIHH courtesy of Cartier who show me the new Tonneau watch. It looked so much better than in the photos, especially in rose gold. I think it was the patina on the dial, The Breguet hands and the way the rose gold matched my skin that blew me away. Wednesday it was back in London and I dropped by at the newly refurbished Cartier boutique to try on the new Crash watch. Only one will be produced every month and will be sold only through the London boutique. I was not sure how it would look on my wrist but amazingly, it fitted remarkably well. Thursday it was the Eurostar to Paris to collect the platinum Tank Cintree which I had ordered a year ago at the SIHH. Most astonishingly on seeing this watch, I had second thoughts and they were not better than my initial thoughts! The platinum Tank Cintree was one of the hits and one of the most sought after watches at last year's SIHH and I had fallen in love with it at first sight. A year later, it failed to make the same impact and Cartier had reserved number 2 for me (even though I had requested for number 16!) I was wondering why my hesitation. 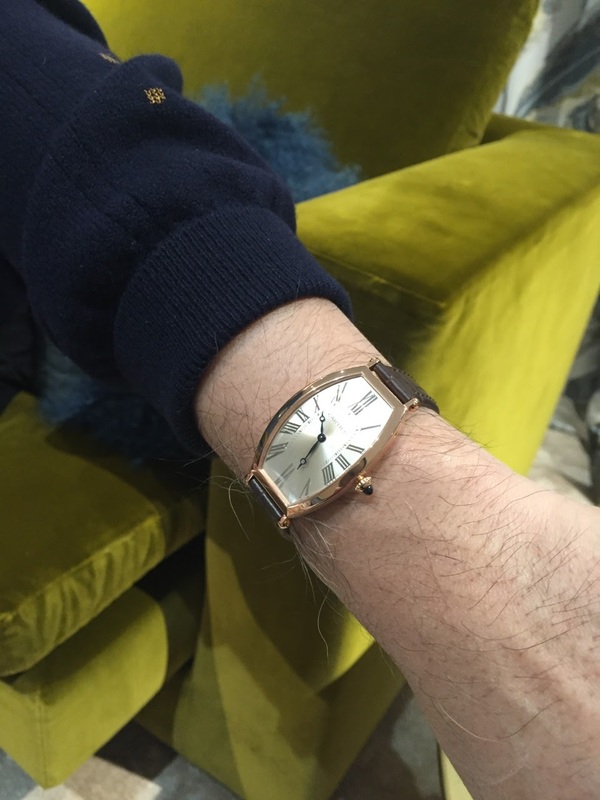 Was it due to the lovely watches I had seen at the SIHH like the Tonneau or was it the undeniable charm of the London Crash watch or was it because I found the bezel of the Tank Cintree too shiny and overwhelming?! There had been a queue of people trying to obtain this watch and yet I seemed unimpressed. I decided to take Nathalie, the charming sales assistant for lunch so that I could think about it further but two hours later, I still did not feel a connection with the Tank Cintree. possibly thanks to my feminine nature! That Tank Normale looks magnificent!! Bad habits die hard but the Crash is sublime!!! You are so right my friend!! And thank goodness I made that exact mistake with the Moser!! Hopefully not with the Lang & Heyne!!! And yes meeting up with you was one of my SIHH highlights. and still the Lang & Heyne triumphs over all my other watches when it comes to daily wear. I think you might need to place an order for one of these my friend because waiting for me to sell mine might never happen! 😁 good for you my friend . Happy to hear that . Have a great time at Basel! At present I have no plans ie no budget for any more watches!! I am quite odd in my preference for watches - quite one dimensional and I tend to sway towards dress watches, the smaller the better! Thanks Mike for your wise advice! Actually, one of those three has been decided upon and will arrive in December apparently And this time I will make sure I have enough time in Paris so that NIco, you and I can meet up!! 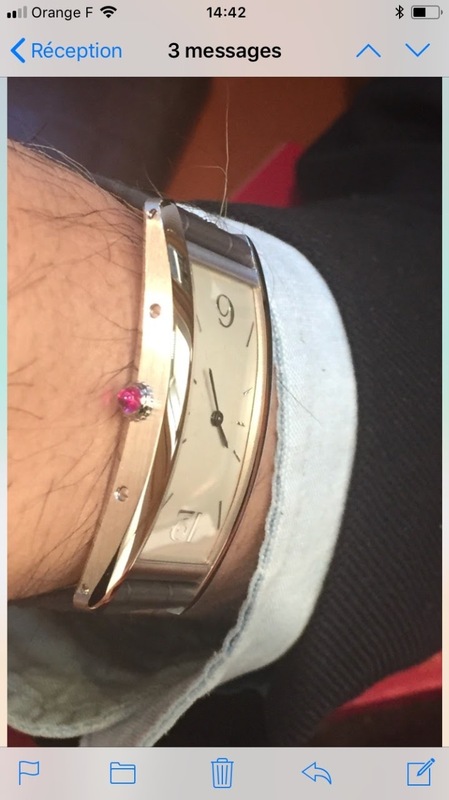 you will be the very first purist to see this watch after I collect it from Cartier. Will give you ample notice to ensure both Nico and you are available. It can only get better Mike! You don't know to which extent you are right, it can only get better. Best wishes and heal well! After care is important. If you'd like suggestions for care complementary to your PT once the cast comes off, you are welcome to pm me. Please PM me in 6 weeks time when the results are out. This is by far more important than watches!!! All of them are spectacular in their own way. From the pictures alone the one that doesn't look good on your wrist is the Cintree. It seems like it might be a little too big. The curve case is very appealing, but I've not seen it in person. It does sound like you've made the right decision and if December comes and you face the same feeling again then you know you must again pass. and I will stay the night in Paris to ensure there is no time pressure. I am afraid you will be very busy taking photos of the Crash and the Moritz Grossmann bespoke set!! but a great favour you are doing me Thank you! I doubt if that makes me a hero especially as Nathalie last year had invited me to join her husband and her at their summer home in the south of France. And please do not use your imagination!! Thank you so much for your well thought of reply and your observations!